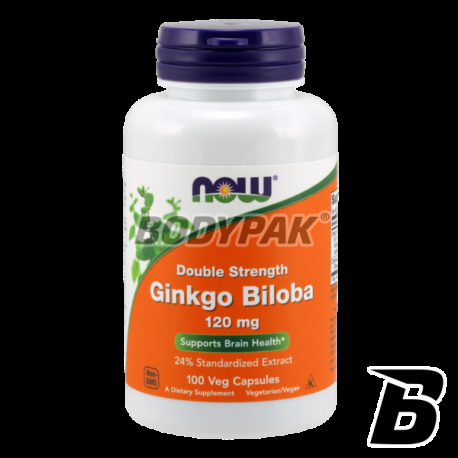 Health & BeautyNOW Foods Ginkgo Biloba - 100 kaps. NOW Foods Ginkgo Biloba - 100 kaps. Ginkgo is used as an anti-aging, particularly in the circulatory system and nervous system. NOW Foods Ginkgo Biloba - 50 kaps. NOW Foods Ginkgo Biloba - 60 kaps. Ginkgo Biloba - a dietary supplement supplementing a normal diet with Ginkgo Biloba. Impaired memory and concentration problems not only affect older people, the first symptoms can occur much earlier. Mental decline may result from disorders of cerebral circulation, and poor diet, lack of exercise, smoking and diseases (eg. Hypertension, diabetes) significantly contribute to this type of change. The improvement of blood flow in the vessels helpful turns out to be an extract from the leaves of ginkgo (Ginkgo biloba). Suitable improving metabolism and circulation of nerve cells because they have higher amounts of glucose and oxygen. Ginkgo Biloba promotes cardiovascular cerebral and peripheral of the lower limbs, and operates a subsidiary in protecting against hypoxic cells. As a result, it improves the ability of learning and memory. The product is recommended as an auxiliary for people with poor circulation, impaired mental concentration, poor memory, tinnitus, impaired hearing or vision. Inne składniki: celuloza (kapsułka), kwas stearynowy (pochodzenia roślinnego). Swanson Full Spectrum Holy Basil Leaf 400mg - 120 kaps. UNS NAC - 90 tabl. Excellent formulation based on top quality N-acetyl cysteine tablets. This is a derivative of l-cysteine, a sulfur amino acid recommended to athletes. Supports the immune system and is a precursor of endogenous glutathione. Has beneficial effects on the liver and the blood circulation! Swanson Inositol 650mg - 100 kaps. Activlab Kudzu Root - 60 kaps. BioTech Ginkgo Biloba - 90 tabl. High-quality natural extract of Ginkgo biloba! Thanks suplementowi help in the regulation and the proper functioning of your body. The force of the fluid nature!